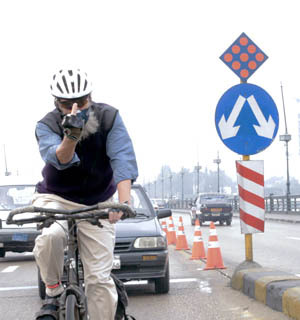 Authorities are warning this morning of a new threat to the safety of Cairene motoristsâ€”angry hippies. While rumors of steadily rising face-mask sales continue to circulate, pedestrians are being advised to take care in crossing the road. â€œThese angry hippies can be dangerous,â€� says taxi driver Ahmed al Soua pointing to mark on the side of his cab. While he says he wasnâ€™t really watching, he thinks the mark may have been caused when he sideswiped a Deadhead on a mountain bike.